Clean air is essential to good health. According to Health Canada, poor air quality can gravely impact the body’s respiratory system and cardiovascular system. The health effects of air pollutants may range from subtle biochemical and physiological changes to difficulty breathing, wheezing, coughing and aggravation of existing respiratory and cardiac conditions. Air Duct system cleaning is recommended on average every 2 years, more often if pets are present in house. We Clean Where You Can’t! Let Us help you make your house healthy ! Your air ducts contain everything from dust, dirt and pollen to spider webs, dust mites and mold spores. Cleaning the air duct system not only reduces harmful allergens but can also lower your heating and cooling costs, reduce furnace maintenance costs and increase the lifespan of your furnace and air conditioning units. With clean air ducts, you also won’t have to dust your furniture and counters as often. As you would expect from Oliva Service, our air duct cleaning products are safe for people, their pets and the environment. Using strongest truck mounted equipment,can optionally apply herbal based sanitizer ( Teatree oil based or Oregano oil based, all natural. )into your air duct system to eliminate mold and bacteria, as well as odours from smoking, cooking and pets. We can even remove the odours left behind by previous tenants or owners. Air Duct Cleaning Procedure, using truck mounted,25HP Engine powered unit. The duct cleaning process may take 2 to 3 hours. Your furnace will be shut-off during this time period. We cover the air filter, isolating the supply side of your duct system from the return side. This allows more air flow during the duct cleaning process. We close and seal (where applicable) all air ducts by placing magnetic covers. We make 8″ opening (if it hasn’t already been done) on the supply side of main trunk by the furnace. Through this hole, we connect our vacuum hose to the supply ducts. Starting with the supply duct that is furthest away, we use our high-pressure air-compressor to blow air through the ducts using 200 PSI pressurized air blaster. After finishing all the supply ducts, we clean all trunk in basement with our exclusive Dust Blaster Air whip. We then cut a second 8 ‘hole, attach our vacuum to the cold air return duct and clean all the cold air vents. Once again, we use our exclusive Dust Blaster and our Skorpion Air Whip. We cover and seal both holes with 10′ plates. When we are finished cleaning, we open the supply vents, close the cold air return and restart the furnace – to ensure your system is working. We offer Free furnace inspections, and dryer vent inspections as well. Upon request, or if needed, we provide cleaning of furnace or dryer vent. We can clean furnace, all inclusive , with the A/C coil as well. 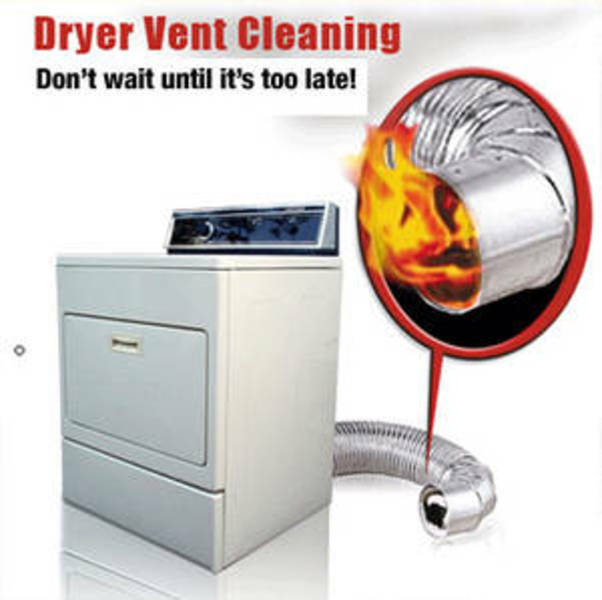 We offer dryer vent cleaning, where we use a special air cleaning tool, that cleans all lines from wall to dryer. Please call us if you need any additional information at 905-827-4554.